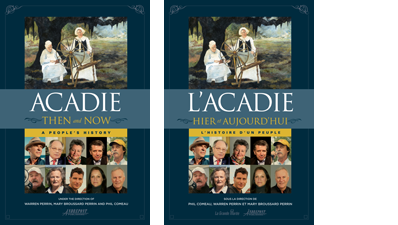 Acadie Then and Now: A People's History is an international collection of articles from 55 authors which chronicles the historical and contemporary realities of the Acadian and Cajun people worldwide. In 1605, French colonists settled Acadie (today Nova Scotia, Canada) and for the next 150 years developed a strong and unique Acadian culture. In 1755, the British conducted forced deportations of the Acadians, rendering thousands homeless, and for the next 60 years these exiles migrated to seaports along the Atlantic Ocean and the Gulf of Mexico, eventually settling in new lands. This tragic upheaval did not succeed in extinguishing the Acadians, but instead planted the seeds of many new Acadies, where today their fascinating culture still thrives. This collection includes articles on the Acadians and Cajuns living today in the American states of Louisiana, Texas and Maine, in the Canadian provinces of New Brunswick, Nova Scotia, Prince Edward Island, Newfoundland and Quebec, and in the French regions of Poitou, Belle-Ile-en-Mer, and St-Pierre et Miquelon. This book provides an international perspective and furnishes the readers with new insights on the past, present, and future of the Acadian descendants from all the Acadies of the world. L'Acadie hier et aujourd'hui – L'histoire d'un peuple est un recueil d'articles rédigés par 55 auteurs d'Amérique du Nord et d'Europe, qui rendent compte des réalités historiques et contemporaines des Acadiens et des Cadiens à travers le monde. En 1605, des colons français ont établi l'Acadie (aujourd'hui, la NouvelleÉcosse au Canada) et au cours des 150 années suivantes, ils ont développé une culture riche, distincte et singulière. En 1755, Les Britanniques ont brutalement déporté des milliers d'Acadiens qui se sont retrouvés sans foyer. Au cours des 60 années qui ont suivi, ces exilés ont erré de port en port, le long de l'océan Atlantique et du golfe du Mexique, pour enfin trouver refuge sur de nouvelles terres et s'y installer. Ce terrible bouleversement, loin d'écraser à jamais les Acadiens, a plutôt ensemencé de nombreuses Acadies nouvelles, dont la culture fascinante fleurit encore aujourd'hui. Ce recueil regroupe 65 articles sur les Acadiens et les Cadiens qui vivent aujourd'hui dans les États américains de la Louisiane, du Texas et du Maine, dans les provinces canadiennes du NouveauBrunswick, de la NouvelleÉcosse, de l'ÎleduPrinceÉdouard, de TerreNeuve et du Québec, et dans les régions françaises du Poitou, de Belle-Île-en-Mer et de SaintPierre et Miquelon. Ce livre offre un point de vue international et, de ce fait, apporte un nouvel éclairage sur le passé, le présent et l'avenir des descendants acadiens de toutes les Acadies, où qu'elles soient dans le monde. For a list of upcoming book events, click here. An important book in Acadian literature. A remarkable book and a remarkable feat to have touched on the Acadian experience from just about every point of view. This book is a colossal work. I am proud to be a part of this project, which provides an impressive collection of perspectives on the Acadian and Cajun experiences. I suspect that this will become a standard reference for years to come. Thank you for all the exhausting work that you must have endured putting this fascinating book together. What you and others have done to offer this amazing book will be with us forever. I cannot imagine all the hours, months and years it took to do this. What dedication! And we, the Acadians receive this gift with heart-felt warmth that will have us reading for many years to come through our children, grandchildren and their children. Our Acadian family lives on in history because of all your research and hard work. Thank you for that. The book is a treasure trove ! I know it will be used for decades to come by students, scholars, genealogists and anyone merely interested in a good read. In 1605, French colonists settled Acadie (today Nova Scotia, Canada) and for the next 150 years developed a strong and unique Acadian culture. In 1755, the British conducted forced deportations of the Acadians, rendering thousands homeless, and for the next 60 years these exiles migrated to seaports along the Atlantic Ocean and the Gulf of Mexico, eventually settling in new lands. This tragic upheaval did not succeed in extinguishing the Acadians, but instead planted the seeds of many new Acadies, where today their fascinating culture still thrives. The collection provides the readers with new insights on the past, present, and future of the Acadian descendants from all the Acadies of the world. The book was directed by Warren Perrin, lawyer, Acadian and environmental activist, and author; Mary Broussard Perrin, artist and author; and Phil Comeau, filmmaker and author, during several years of preparation. All profits from the book will be donated to 22 Acadian museums which are located in three countries. Prior to his death, Cajun artist George Rodrigue gave his permission to use his painting for use on the books' cover. Warren A. Perrin – born near Erath and currently residing in Lafayette, Louisiana. He holds a Juris Doctorate degree from Louisiana State University School of Law and is an attorney with the firm of Perrin, Landry, deLaunay, Dartez, and Ouellet. From 1994 to 2010, he was president of the Council for the Development of French in Louisiana (CODOFIL) and an adjunct professor at the University of Louisiana at Lafayette. He was a member of the board of directors of the Congrès mondial acadien-Louisiane 1999, president of the Lt. Governor's Task Force of FrancoFête 1999, and the founder of the Acadian Museum of Erath, Louisiana. Perrin represented Louisiana and the U.S. at the World Francophone Summits in Hanoi, Vietnam; Moncton, New Brunswick; Bucharest, Romania; Quebec City, Canada; and Montreux, Switzerland. He is the author of six books dealing with French culture, including Acadian Redemption (2004), the first biography of an Acadian exile and which reveals how he obtained a successful resolution of his "Petition for an Apology for the Acadian Deportation" from Great Britain, resulting in "The Queen's Royal Proclamation," signed on December 9, 2003. The book was translated into French as Une Saga Acadienne (2005). In 1999, French President Jacques Chirac bestowed upon Perrin the French National Order of Merit. He received an honorary Doctor of Laws at Université Sainte-Anne in Nova Scotia, Canada. In 2007, Perrin was inducted into the Louisiana Justice Hall of Fame and in 2012 he was named chairman of the Francophone Section of the Louisiana State Bar Association. Phil Comeau – film director, writer, and editor, was born in Baie Sainte-Marie, Nova Scotia and lives in Montreal. Comeau studied dramatic arts at Université de Moncton in New Brunswick, and cinema in Paris, France. He has directed 100 drama and documentary films and television episodes in 25 countries, of which a third are films on Acadians. His films have won over 40 awards in Canada, the U.S., and Europe. He has also written some 70 film scripts; published poems in Plumes d'icitte and Éloizes; written an Acadian French dictionary, Les mots acadjonnes; and written articles for the Montreal magazine L'Actualité. For his contributions to Acadian culture and cinema, Comeau received the Order of Canada, l'Ordre des francophones d'Amérique in Québec, l'Ordre des arts et des lettres in France, the Prix Méritas of the Fédération acadienne in Québec, and the Prix Grand-Pré in Nova Scotia. Comeau has also received honorary doctorates from Université Sainte-Anne and Université de Moncton, both in Canada. Mary Broussard Perrin – A mixed media artist living in Lafayette, Louisiana, she works in painting, photomontage, artist books and performance art and is a former educator and gallery owner. She earned a Bachelor of Fine Arts from the University of Louisiana and a Master's in Visual Art from the Vermont College of Fine Arts. She has work in the collections of the National Museum for Women in the Arts in Washington, D.C.; the Ogden Museum of Southern Art in New Orleans, a branch of the Smithsonian; the New Orleans Museum of Art; and the Louisiana State Museum in Baton Rouge, Louisiana. 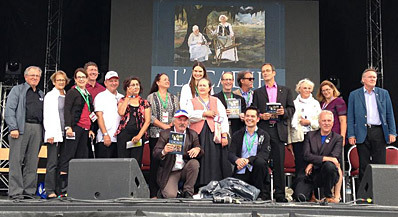 Shown are authors (kneeling), left to right, Jean-Marie Nadeau (NB), André-Carl Vachon (QUE), and George Arsenault (PEI); standing, left to right, Raymond Gaudet (QUE), Évangéline Richard (QUE), Mary Broussard Perrin (LA), Gregory Wood (MD), Marty Guidry (LA), Sandra Pettipas Perro (NS), Gisèle Faucher (ME), Marie Rundquist (Md), Natial Perrin d'Augereau (LA), Warren A. Perrin (LA), Barry Ancelet (LA), Phil Comeaux (QUE), Michèlle Touret-Bodin (FRANCE), Marie-Claude Rioux (NS), and Richard Holledge (ENGLAND). Barry Jean Ancelet, Ph. D.
Shane K. Bernard, Ph. D.
May Gwin Waggoner, Ph. D.
Whitney P. Broussard, Ph. D.
Thomas L. Linton, Ph. D.
Gregory A. Wood, Ph. D.
Joseph Yvon Thériault, Ph. D.
Order a copy of Acadie: Then and Now in our online boutique. Authors Warren and Mary Perrin are available to do a booktalk for your group. If interested, please contact us by calling 337-233-5832 or via our contact form.